Magnesia brick, MgO content up to 90%, is a kind of basic refractory, mainly quartz is percales.And it is generally divided into sintered magnesia brick and chemical combination of magnesia brick, also known as unfired magnesia bricks. 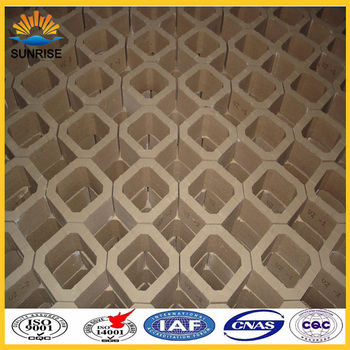 High purity and fire resistance, because of MgO grain contact directly, known as a direct combination of magnesia brick; the other kind is called electro-fused magnesia bricks. Magnesia brick has high fire-resistant degree, good alkali tolerance, softening temperature under load higher, but thermal shock resistance is bad. Sintered magnesia brick take magnesia brick as raw material, after ingredients, crushing, mixing, forming, and 1550 ~ 1600 °C temperatures firing. High purity products firing temperature is at 1750°C or higher. No pouring magnesia brick produced by adding proper chemical bond, then mixing, forming and drying. Mainly used in ceramic frit furnace, sodium silicate furnace, glass melting furnace regenerator, steeling furnace, bottom and wall of electric furnace, permanent lining of oxygen converter, non-ferrous metal smelting furnace, high temperature tunnel kiln, sintered magnesia brick and cement kiln liner, bottom and wall of mill furnace, etc.